Here is Piper, A Golden Retriever pup. Piper is dressed as a pretty little Golden Indian. This Costume was also done by Tobi, who is the owner of the Great Dane, Mattie (in the White Horse costume here). 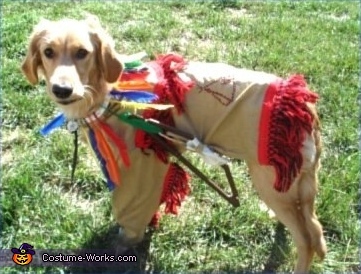 This homemade costume for pets entered our 2007 Halloween Costume Contest.